Petite Impact: Review- Gucci Marmont Chevron Velvet Shoulder Bag! 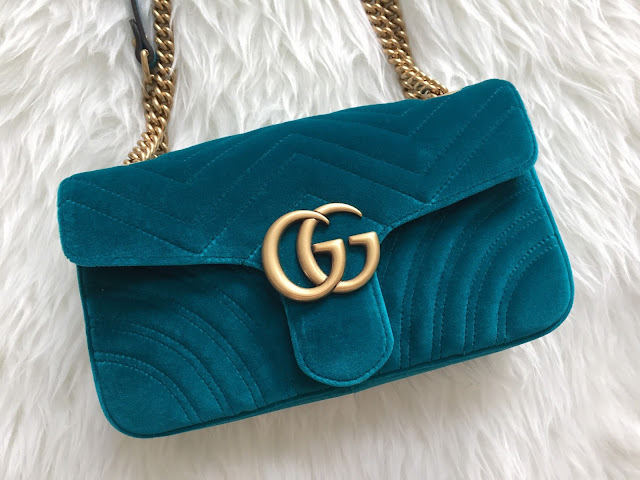 Review- Gucci Marmont Chevron Velvet Shoulder Bag! Gucci is super hot right now. I've never really liked any Gucci enough to buy until the Marmont line. The chevron pattern gives off a very 70s vibe but with an updated feel. The double G hardware is antiqued gold tone which gives it a more subtle look instead of the bright in your face gold. A couple of months ago, my mom went to Italy for vacation and brought back this little gem for me! Mine is the teal color from fall/winter 2016. This season they are releasing the bag in a pretty pink, black, red/fushia, and blue. I have the small size which is 10 inches by 6 inches by 3 inches deep. I think it's the perfect size bag for everyday. Normally I would consider a velvet bag to be a piece I would only carry in the fall or winter, but when I paired it with this summery dress it really worked nicely with brown sandals. I would totally wear this outfit on date night for sure even in the summer. The strap can be worn two ways. You can carry it messenger style or you can double up the straps and carry it on your shoulder. I prefer to carry it messenger style as I love a hands free bag. The back of the bag has a heart on it, which makes it feel a little whimsical and carefree. Normally I would consider something like this a little bit on the cheesy side, but I like that it makes me feel young. The velvet is super soft to touch. It makes me want to pet it all day. One caveat about velvet bags is the maintenance. The velvet can scuff if you're not careful with it. Luckily if velvet isn't your thing? This bag also comes in leather as well. If size small is too big for your tastes, this bag also comes in a mini size. Underneath the flap is a spring buckle. I found it easy to open and close. Inside lining is a bright red and made of silk. Overall this makes a great bag that can transition from day to night. That's all for me today! If you have any questions about this beauty, leave me a comment below! 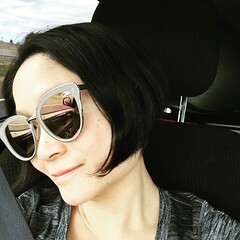 Hope you all have a great Monday! Oops, I so didn't mean to delete your comment! Pressed the wrong button by accident and it won't let me undo it. But yes, perfect for date night! Same here, I want another sneak peak already! Hope she posts more pics this week. Color is super duper pretty and goes perfect with your dress!! Bitcoin? Wow. I wouldn't even know what to do with it! Thanks!! I think the dress definitely makes this bag pop even more so. I am also going to pair it with jeans to make the outfit look more dressy.